It was done in a timely manner and looks great! Drive attendance and make your facility easy to navigate with attractive, cohesive church signs by Sign Connection! Places of worship can benefit from a wide variety of signage types, including identification signage, promotional signage, wayfinding signage, and safety signage. The right signage blend makes it easy for your patrons to find your location, as well as comfortably and safely navigate your space. Have an upcoming play, vacation bible school, or special event? Promotional signage and message boards make it easy for you to spread the good word! 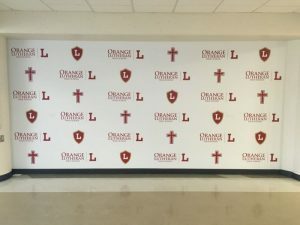 Whether your congregation and facilities are large or small, Sign Connection the right signage solutions for your needs. Make your church a welcoming sanctuary with impactful outdoor signs and graphics. Whether you are looking to share information about special events, or want to make sure your signage reflects your unique message, we can help. 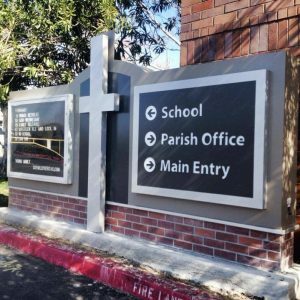 Sign Connection creates custom monument signs, announcement boards, yard signs, promotional event signage, building signs, custom crosses, and any other custom church signage you may need to get the word out about who you are and what you have to offer. Since churches typically provide services to people of all ages in different areas of their facilities, it is important that they have appropriate signage that effectively allows everyone to easily get where they are supposed to be. ADA signs and wayfinding signage help to identify different rooms and areas, making it easy for your worshippers navigate your space. Wall murals and vinyl graphics are another great option for adding excitement and intrigue to otherwise boring walls. Display parables in full color graphics to support comprehension of the important lessons they hold, or add wayfinding directly to the walls in a unique, exciting, and innovative way. Sign Connection is a full-service sign company, providing complete signage services from design-installation. Our experienced and dedicated team are able to handle even the most complex jobs, including complete signage renovations, new facility signage, or single supporting elements to complement your existing signage. Whatever your needs may be, we are dedicated to using cost-efficient and environmentally-friendly materials and processes that are durable and long-lasting. Our goal is to create signage that is impactful, attractive, and that works for you long-term. With expert sign design, local manufacturing, and talented installers, we are committed to creating the right signs for your needs. 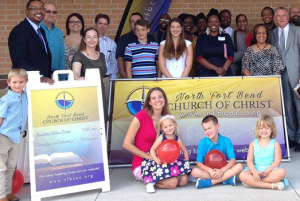 Sign Connection is your local church signs provider, creating the impactful, attractive, and informative signs you need to support your congregation. We look forward to becoming your sole signage provider for all of your church signage needs! 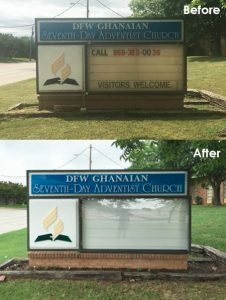 Call Sign Connection today at (937) 203-4481 for a Free Consultation with a Church Signs Specialist!